McAfee Antivirus Plus or McAfee Internet Security and other McAfee software require Internet Explorer as the default browser. This should be the setup of McAfee users if they want McAfee to run properly or without issue. A particular version of Internet Explorer should be available prior to installing McAfee programs. New or beta versions of the Microsoft web browser are usually not compatible with McAfee. Below are some of the solutions when someone asks, "Why won't my McAfee software won't let me go to McAfee website." McAfee software uses Internet Explorer to run properly. Any incorrect settings in IE or missing and corrupted IE installations will affect McAfee products. Ensure that the settings of Internet Explorer are correct and that IE files are registered correctly. Open Internet Explorer > Tools > Internet Options. Click LAN settings and then uncheck all boxes in the Local Area Connection (LAN) settings window. Click OK and close IE options. 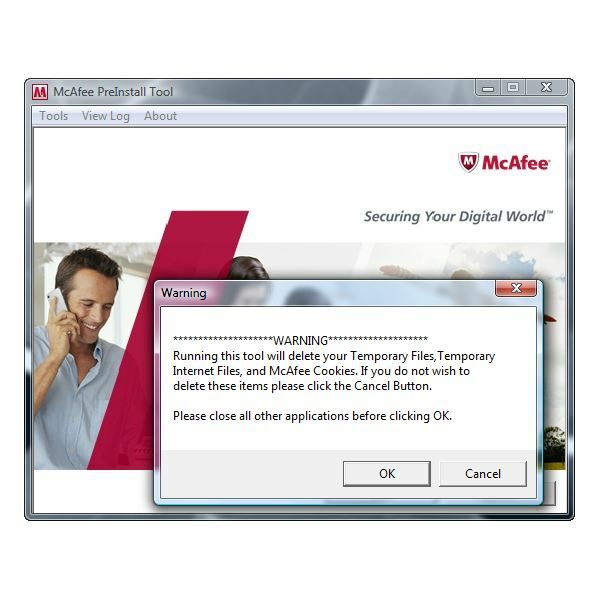 Download McAfee PreInstall tool from McAfee website. Save the file on the desktop and run Mcpreinstall.exe by double-clicking the tool. Click the Start button in the PreInstall tool window. Click OK to proceed cleaning the temporary Internet files and McAfee cookies. When the PreInstall tool has finished with its task, you should see a confirmation dialogue box that the operations completed successfully. Note that you can always view the log file of the PreInstall tool by clicking on View Log in the PreInstall tool menu bar. The log file is located where you run the tool e.g. from the desktop. The log file contains the information on which dll files of Internet Explorer were missing but were successfully registered by the PreInstall tool. Now try using McAfee software or visit McAfee website within the McAfee product user-interface. Internet Explorer 6 and later versions are the supported browsers by a McAfee program. If you are using a beta version of Internet Explorer, you need to downgrade to version 8 or 7. Some users continue to have issues with McAfee software if the system is using version 8 of Internet Explorer. To troubleshoot the problem, try downgrading to version 7 by removing IE8. If you need help with that, see the guide on how to remove IE8 in Windows. Note that IE6 is no longer supported by Microsoft because it's now an obsolete version. It's best to not to downgrade from IE8 or IE7 to IE6. After removing IE8, reboot the computer and try visiting the McAfee website using the browser or by clicking links in the McAfee software to view or manage your McAfee account. If any of the above solutions will not help, check if McAfee software is corrupted or damaged. Download McAfee Virtual Technician from McAfee website and then run the tool. The tool will find issues in McAfee program, and if there's problem, a fix should be provided or done by the tool. There are security incidents where malware may be preventing McAfee software from communicating to McAfee servers. Scan the computer using an online scanner or anti-malware program such as Spybot-Search & Destroy, Malwarebytes Anti-Malware or Hitman Pro. Reset Internet Explorer settings using Microsoft Fix it 50195. Reset the Hosts file in Windows Microsoft Fix it 50267.